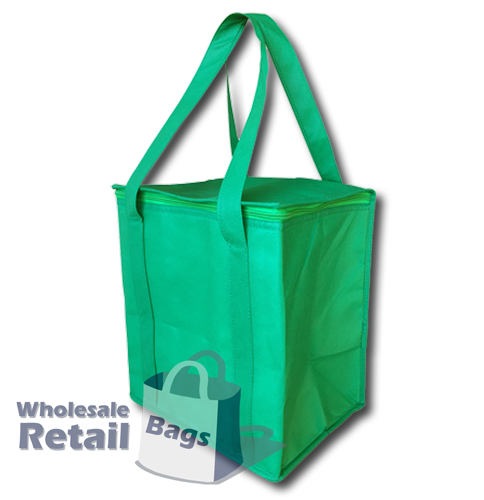 The nonwoven cooler bag is extremely popular with retail grocery clients. A generous size combined with moderate insulating qualities make it ideal for the transport of cold grocery items like milk or meats. The bag contains a foil insulation, as well as a zip that runs around the top of the bag, to help keep the cold inside the bag. The straps running down the sides of the bag make for a relatively constrained print area. Customers are encouraged to produce tall artwork layouts in order to achieve the best value for money with their branding on this bag. We also carry a standard nonwoven bottle cooler bag.